While I was home I resolved to buy as much local chocolate as I could and try it out. I was pleasantly surprised by some (like Wild Sweets) and disappointed by others. But on the pleasantly surprised camp came Take a Fancy. 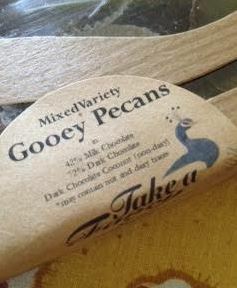 They are a small bean to bar chocolate maker who also do some delicious gooey pecan and caramel clusters. I wish I had bought more. Writing this is like torture. 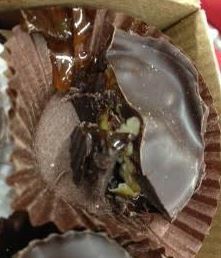 Dark chocolate and coconut (non-dairy option) – gorgeous chocolate & lush pecans in a runny caramel – GOOEY but good but not a whiff of coconut. This is just amazing and there is an intense fruitiness coming out of the chocolate in this pairing that is making me wonder how the heck to get more of these in my life! Milk chocolate – smooth malted flavour – thick caramel with hints of salt. Amazing milk choc. Didn’t get nibs but it is absolutely amazing flavour. Really lovely and delicious but I think weirdly the coconut might be my favourite. 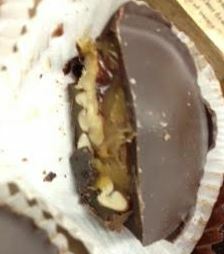 Dark chocolate – interesting – I feel like the chocolate is less intense than the coconut and even slightly bitter. Almost like this caramel is slightly different & thus the interplay between the dark choc & caramel is less awesome than with the coconut. Overall I have to say that the non-dairy version of the caramel with the coconut wins hands down. 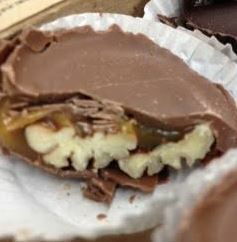 I love the really runny caramel, I love the combination of the caramel and fruity chocolate and the pecans just add enough that it makes this amazing.